The Washington Post editorial board has accused President Trump of being “complicit” in Hurricane Florence, because “he plays down humans’ role in increasing the risks” of “extreme weather,” and “he continues to dismantle efforts to address those risks.” Such weather, they say, is fueled by manmade global warming that creates “unusually warm ocean water” that worsens hurricanes. The board finishes by declaring that Trump and Republicans are guilty of “reality denial” on this issue. However, their editorial is the antithesis of reality. Trump hasn’t been in office nearly long enough for his policies to alter the earth’s greenhouse gas levels. In fact, his plan to repeal Obama’s “landmark“ climate change regulation has not yet been implemented. Furthermore, Charles McConnell, a former assistant secretary of energy under Obama and the director of Rice University’s Energy and Environment Initiative, estimated that this regulation would decrease global temperature by only 0.01 degree Celsius by 2030. Thus, to blame Trump for Hurricane Florence or any other hurricane in the past or future is absurd. 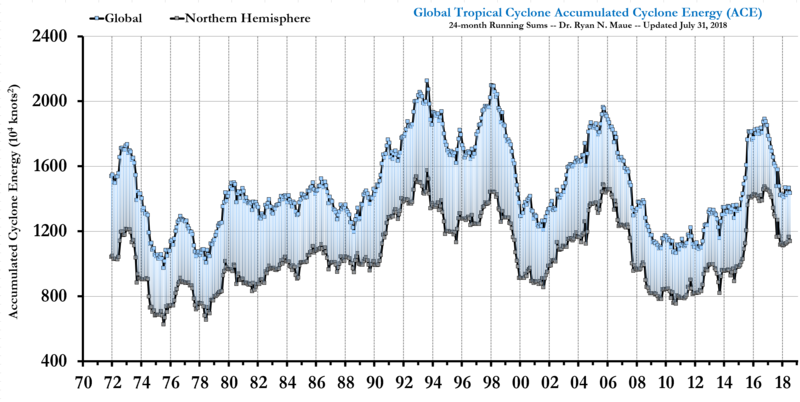 global hurricane frequency, hurricane intensity, hurricane duration, and general rainfall trends have been level. 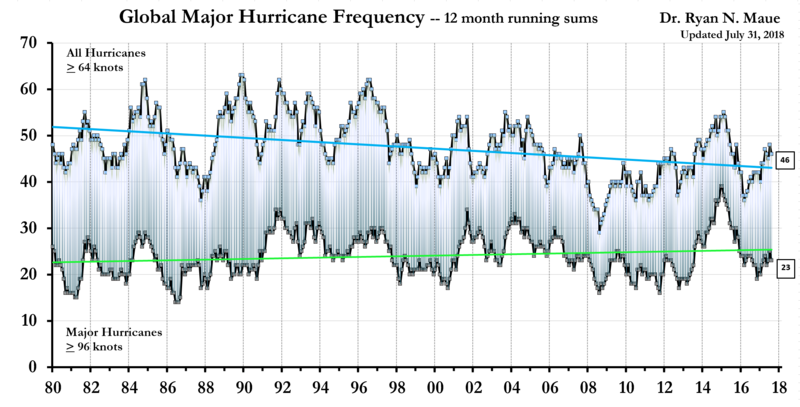 Atlantic hurricane frequency and intensity trends have been level. 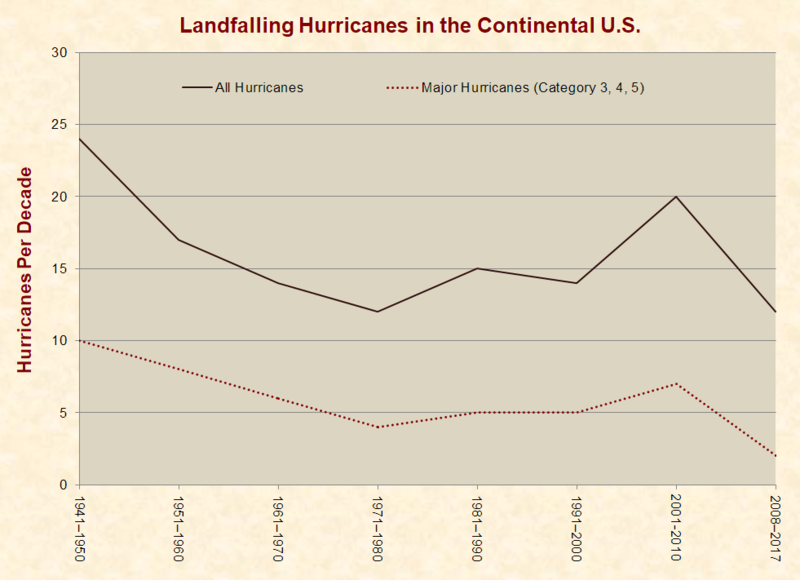 U.S. hurricane strikes, major hurricane strikes, and flood trends have been level. 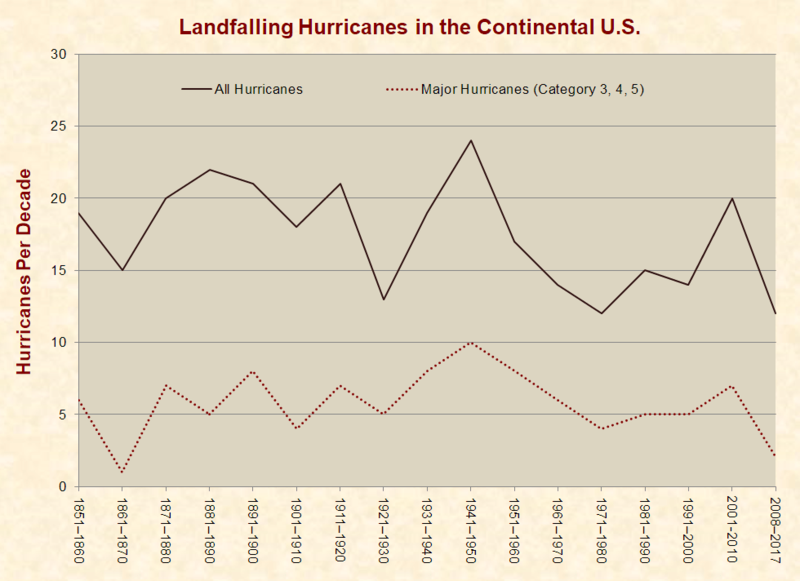 Contrary to the Post and other media outlets, cyclones and hurricanes have not become more common or intense. As the Intergovernmental Panel on Climate Change (IPCC) reported in 2012: “There is low confidence in any observed long-term (i.e., 40 years or more) increases in tropical cyclone activity (i.e., intensity, frequency, duration), after accounting for past changes in observing capabilities.” This also applies to hurricanes, which are tropical cyclones with winds exceeding 73 miles per hour. In spite of all those facts, a national scientific poll commissioned by Just Facts in 2017 found that 69% of U.S. voters believe that the global “number and intensity of hurricanes and tropical storms have generally increased since the 1980s,” including 90% of Democrats and 46% of Republicans. This disconnect between perception and reality accords with a mass of global warming-related misinformation spread by the press. A common thread among much of this misinformation is a focus on local conditions, anecdotes, and short-term trends. Because the earth is vast and its climate varies widely over time and place, it is easy to paint a misleading picture by highlighting certain aspects of it. Because of the timespan involved, no one could possibly know these facts from life experience, even if they had perfect memories. Yet, a 2008 survey of Virginia residents found that the most common answer people give for believing or disbelieving in global warming is their personal experience of the climate. This makes them easy marks for those who mislead by using half-truths. Even if this data showed rising numbers of hurricanes, the Geophysical Fluid Dynamics Laboratory emphasizes that one cannot logically assess hurricane trends based only on those that reach land, because they are “much less common” than the full number of hurricanes that form at sea. This highlights the importance of not drawing conclusions from narrow data. The U.S. contains only 1.9% of the world’s surface area. Yet, media outlets and global warming activists often argue that the sky is falling based on local trends and events. This is called “cherry-picking,” which is reporting only information that accords with a certain view while ignoring everything that does not. It is the equivalent of lying by omission. “human-caused climate change is supercharging” hurricanes. This is a classic example of cherry picking, because it singles out one year from one area of the world. 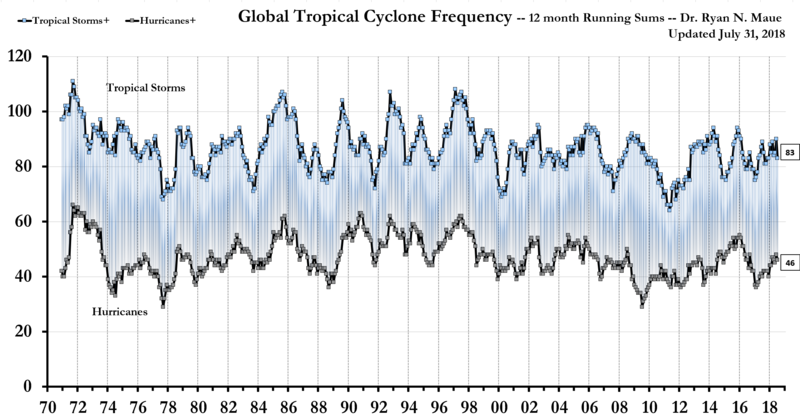 In contrast, the comprehensive data provided in the charts above show that global cyclone energy and frequency trends have been about level. The authors also write that “increases in Atlantic hurricane activity in the 20th century have been attributed mainly to the increases” in sea surface temperatures, which are “primarily driven by human increases in greenhouse gas concentrations….” Once again, the IPCC and Geophysical Fluid Dynamics Laboratory have found no detectable increase in Atlantic hurricane activity over the 20th century. From that mundane result, the authors jump to the assumption that record-high ocean temperatures “likely” increased Harvey’s “size and intensity” and “contributed substantially to the flooding caused by rainfall on land.” This is irrational, because there is a significant difference between: (a) finding that a storm absorbed and released a certain amount of heat from the ocean, and (b) concluding that the storm absorbed more heat than it otherwise would have because the ocean was warmer than normal. The authors don’t empirically justify that leap of logic. Instead, they repeatedly assert that warmer oceans create more cyclone activity. However, at the end of one paragraph, they reveal that this conclusion comes from “global modeling experiments” and “dynamically downscaled experiments.” These are computer models that predict what will happen—not what has actually happened. True science is concerned with understanding nature no matter what the methodology. In our view, if the wrong equations are programmed because of inadequate understanding of the system, then what the computer will produce, if believed by the analyst, will constitute the opposite of science. A 2012 paper in the Hydrological Sciences Journal examined U.S. flood trends from 200 water gauges with records extending from 85 to 127 years ago. This study found “no strong empirical evidence” for increased flood magnitudes across any of the four major regions of the United States. In the Southwest, the study actually found a decrease in flooding, and in the Northeast, it found results that are “suggestive” of increased flooding but not statistically significant. Nonetheless, Trenberth, his coauthors, and the Post’s editorial board ignore such facts while touting anecdotes, model predictions, and leaps of logic. Scientists also warn that climate change may be slowing the wind currents that guide hurricanes, making storms more sluggish and, therefore, apt to linger longer over disaster zones. Tropical cyclone movement has slowed all over the planet. Harvey’s stubborn refusal to leave the Houston area was a decisive factor in its destructiveness. Florence may behave similarly. The hyperlink in the quote above leads to an NPR article, which links to another NPR article, which names the author of a study “published Wednesday in the journal Nature.” None of these publications provide a link to the study or its title, thus ensuring that the vast majority of readers will never lay eyes on it. Except for its abstract, the paper itself is locked behind a paywall, providing another barrier to the primary source. The analyses presented here do not constitute a detection and attribution study because there are likely to be many factors, natural and anthropogenic [manmade], that control tropical-cyclone translation speed. This study calculates the speeds at which tropical cyclones moved over each of their lives by using data on their positions at different points in time. The data covers the globe from 1949 to 2016, and the calculations show that their overall speed declined by 10% during this period “in which global-mean surface temperatures increased by about 0.5 °C.” The paper also says that “the slowdown varies substantially by region and by latitude, but is generally consistent with expected changes” caused by manmade greenhouse gas emissions. Furthermore, the study’s findings are at odds with data on U.S. floods. The study states “there is a substantial and significant slowing trend over land areas affected by North Atlantic tropical cyclones (20% reduction over the 68-yr period),” and this has “almost certainly increased local rainfall totals” in this region. However, the above-cited 2012 paper on U.S. flood trends found “no strong empirical evidence” for increased flood magnitudes across any of the four major regions of the United States. In addition to slandering the president of the United States, the Post’s deceptive editorial has the potential to cause serious harm in at least three ways. First, it may spur voters to support policies that can increase hunger. For instance, a 2018 study in the journal Nature Climate Change found that “by 2050, stringent climate mitigation policy, if implemented evenly across all sectors and regions, would have a greater negative impact on global hunger and food consumption than the direct impacts of climate change. The negative impacts would be most prevalent in vulnerable, low-income regions such as sub-Saharan Africa and South Asia, where food security problems are already acute.” Note that this study, like all studies that project such effects of government policies, should be taken with a grain of salt. This article has been republished with permission from Just Facts Daily. James D. Agresti is the president of Just Facts and the author of Rational Conclusions. He holds a Bachelor of Science in Mechanical Engineering from Brown University and has worked as a designer of jet aircraft engines, a technical sales professional, and chief engineer of a firm that customizes helicopters.